DataForSEO got the awards from FinancesOnline! 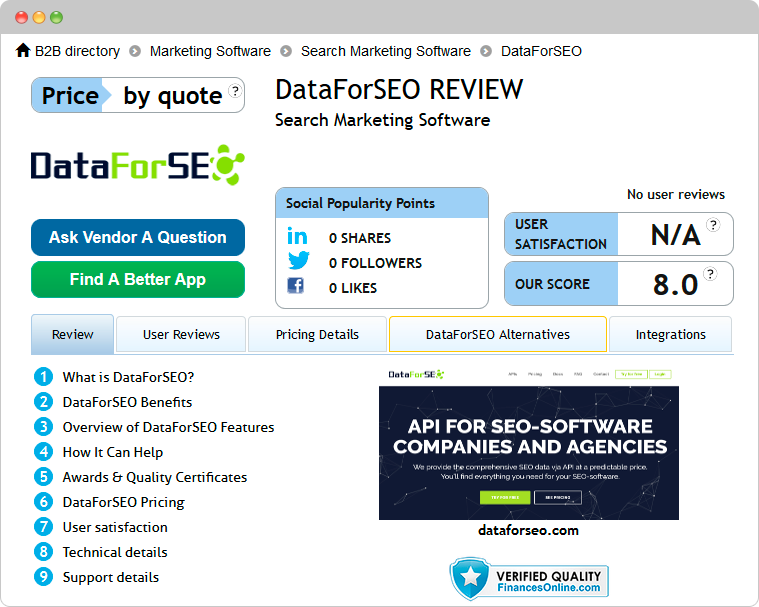 We are excited to inform you that DataForSEO got a very positive review from FinancesOnline.com, one of the most popular and fastest-growing review platform for software and B2B services. In their DataForSEO review, the experts did a thorough analysis of our API’s capabilities and gave us a positive score of 8.0. DataForSEO was also evaluated from the user satisfaction perspective, and we got an impressive 100% user satisfaction score, which really shows how well-received our service is by actual DataForSEO users. We got the Verified Quality Certificate that proves DataForSEO is one of the most trusted companies in the best marketing software category at FinancesOnline. The experts behind our review liked our service so much that they decided to distinguish us with two of their awards. DataForSEO won the Great User Experience Certificate. That mean that our product offers especially good user experience. We were pleased to learn about such signs from our users. DataForSEO also won the Rising Star for 2017 Award. That award speaks for itself. We gain 31st place of the top 500 Marketing Software products. It is the great result for the start. Both of these awards highlight the fact that we offer qualitative, efficient solutions that are also easy to implement and intuitive to use.